Can Allergies Cause Fatigue & a Low Grade Fever? Genevieve Van Wyden began writing in 2007. She has written for ‚ÄúTu Revista Latina‚Äù and owns three blogs. She has worked as a CPS social worker, gaining experience in the mental-health system. Van Wyden earned her Bachelor of Arts in journalism from New Mexico State University in 2006. Whether it is spring or fall, if you suffer from allergies, you run the risk of becoming sick. For some sufferers, allergies cause nasal congestion, headache and cough. For others, if their bodies react strongly enough, their symptoms may include a low-grade fever and fatigue. It is important to know how to treat your symptoms so you begin feeling healthy again. Your allergy symptoms may include nasal congestion – stuffiness – and a runny nose. Your nose may itch, and you may sneeze as you try to rid your nose of offending allergens. Your eyes may itch and water as your system reacts to the substances to which you are allergic. As your nasal passages and sinuses become congested and inflamed, you also may develop a headache. As your body tries to rid itself of pollens, you may get a dry cough. You also may become fatigued – not sleepy – as your body tries to fight off the pollens around you. 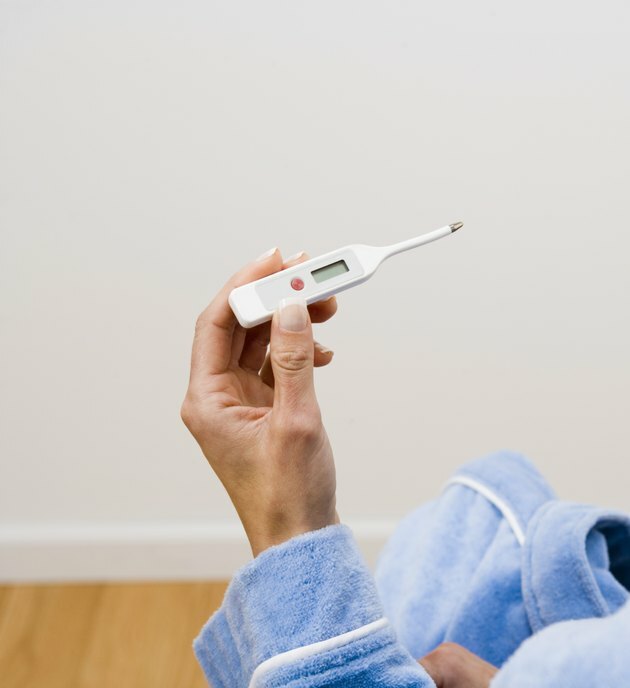 As your allergy symptoms worsen, you may develop a low-grade fever, which can reach 100.5 degrees Fahrenheit. Your body responds too strongly to pollen produced by flowering plants. The pollen is the male reproductive cell of the plant. If you are not allergic, the pollen does not make you sick, but if you are allergic, your body mounts a defensive response. Brightly colored flowers rarely produce allergy-causing pollens. The problem comes from plants that pollinate using the wind to spread each pollen cell. Large quantities of pollen can be spread on a windy day, sometimes as much as 20 miles. The troublesome pollens come from junipers, pine trees, all grasses, several varieties of weed and many common deciduous trees – those trees whose leaves mature and fall in the autumn. Treat your symptoms at home with an over-the-counter allergy medication. Follow dosing instructions on the package as these medications may cause sleepiness. If you do not suffer from high blood pressure, drugs containing pseudoephedrine can help relieve some of your symptoms. This medication also makes people sleepy after taking the recommended dose. If your symptoms do not improve within 72 hours of self-treatment, make an appointment to see your doctor. Call for an appointment if your fever goes over 100.5 degrees Fahrenheit; your nasal discharge becomes discolored, not clear; you feel tenderness or pain around your eyes and in your forehead; you produce discolored mucus when you cough; and you are fatigued due to taking an over-the-counter medication. Find out which pollens are in the atmosphere. Medical centers, universities and medical clinics maintain certified aeroallergen counters, enabling you to find out what kinds of pollens you are inhaling. Stay indoors when you can. If you have to go outdoors, change your clothing, shower and wash your hair when you get back home so you can wash allergens off. Can Seasonal Allergies Make You Sleepy? Can Allergies Cause a Dry Nose?